Similar to dirty diapers and spit-up, a rash that appears recurrently on an infant’s face who is breastfeeding is a usual part of infanthood that almost all babies suffer from. However, the red colored irritation may also imply that your infant’s body is allergic to a chemical or a food. 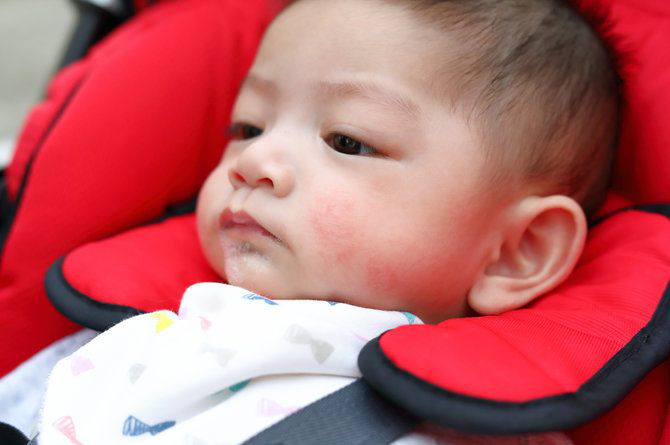 Read on to learn about rashes on face of babies so that you can make out whether the facial rash will disappear by itself or it requires a visit to a physician. Some lactating females notice difference in the health or behavior of their babies when they consume certain foods. The foods that cause the most problem and that have been linked conclusively by research to gassiness or fussiness in babies is products made of cow’s milk. However, other foods may cause reactions in some babies. But sensitivity to food in babies who are breastfed is not as common as thought by many lactating mothers. In case a breastfed infant has sensitivity to a specific food, they may become fussy post feedings, cry for long duration or sleep very little and will wake up suddenly due to discomfort. A history of allergies may exist in the family. Some other signs of allergy to food are hives, breastfeeding rash on baby, sore bottom, eczema, dryness of skin; asthma or wheezing; symptoms like a cold or congestion; itchy, red eyes; infections of ear; colic, fussiness, irritability; constipation or diarrhea, vomiting, intestinal upsets or green colored stools with presence of blood or mucus. How severe the reaction to a food is usually related to degree of sensitivity of baby and the quantity of problem food which the mother ate – the greater the food consumed and the more the sensitivity of the baby, the more severe will be the reaction. Reactions to food may appear within a few minutes; however, symptoms in infants who are breastfed commonly appear up to four to 24 hours post exposure. If infant has developed an acute allergic reaction in case when mother has either eaten a new food or has eaten a particular food in large amounts, then they will become normal in a few hours. If the infant has sensitivity to a particular food that mother consumes frequently, then they may have ongoing symptoms. What Foods Most Likely Cause Allergy in an Infant? Some common foods that cause allergy in infants and produce symptoms of breastfeeding rash on baby are cow’s milk products, wheat, soy, eggs, peanuts and corn. Keep a journal of food and record foods consumed with behavior and symptoms of baby along with the time of day. This will help you in pinpointing the problem food. What to Do If a Particular Food Causes the Symptoms? If you have determined that breastfeeding rash on baby is caused due to a specific food, then remove that particular food from your daily diet for two to three weeks and see if there is improvement in symptoms of your baby. It may not be helpful to remove a food item for less than two to three weeks. For instance, protein from cow’s milk may remain in the mother’s body for around 1-1/2 to 2 weeks. Moreover, it may take another 1-1/2 to two weeks to get out of infant’s system. Symptoms of the baby will start improving within five to seven days of removing the problem food. However, there may not be immediate improvement, particularly, if you have been eating the problem food regularly as a part of your diet. In fact some babies may feel worse in the initial week before symptoms start improving. Sometimes, it may take several weeks before symptoms improve. One method to confirm whether that particular food is the problem food is to consume that same food again and see if your baby develops the same allergic reaction. The greater the severity of your infant’s original symptoms, the more you should wait before starting to eat that food again. If the reaction is very severe, you should not start eating the food at all. If similar symptoms are not produced in your baby then probably they are not sensitive to this particular food. If your infant has only slight sensitivity to a specific food, you can just limit the quantity you eat, instead of eliminating it altogether from your diet. Majority of the infants out grow food sensitivities over a period of few months to year; however, some may persist longer. Allergens from the environments that may lead to breastfeeding rash on baby include detergents, soaps, moisturizers and lotions. Try to avoid using them in daily routine. Infants aged three weeks to six months often develop a harmless, ongoing rash on face referred to as facial acne. It appears as small, red colored bumps on the forehead, chin and cheeks. This rash is medically called seborrheic dermatitis and it develops due to the effect of maternal hormones, which are present in the body of the baby. The rash worsens when the baby cries due to increased blood flow to the arteries present beneath the facial skin. Acne on baby’s face usually gets better on its own, often in a couple of weeks after it appears; however, facial rashes due to allergies require help. You should clean the face of your baby with either plain water or gentle baby soap. Don’t use irritating soaps and lotion on their face. Use mild detergent and run each wash cycle through double rinse to make sure that the debris of detergent is rinsed thoroughly from your baby’s clothes. Take your baby to their pediatrician if their rash aggravates or there is appearance of other symptoms. They may prescribe anti-inflammatory cream to apply topically, depending on your baby’s symptoms, or advise you to remove certain specific foods from the diet to see if there is improvement in rash.